Time to start making your vacation plans. 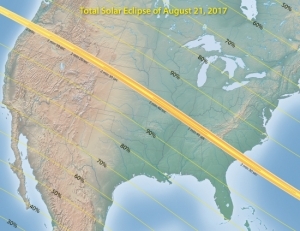 On August 21, 2017 a total eclipse of the sun is going to traverse the entire length of the continental United States, from Oregon to South Carolina. Kentucky will have the longest view, with totality as long as three minutes. And astronomers are already thinking of ways to harness the help of the American people in observing this event. In a paper published today on the Los Alamos astro-ph website, a team of astronomers are proposing organizing something they have dubbed the U.S. Eclipse MegaMovie, whereby they gather together as many images of the totality as possible and assemble them into a single film, showing the evolution of the sun’s corona as it crosses the continent.